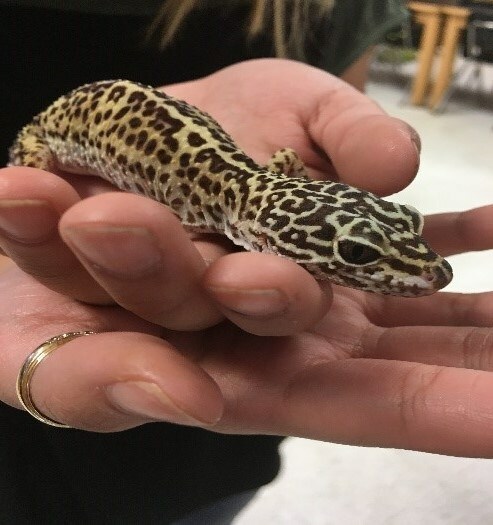 Leopard Geckos are typically found in captivity and have become very common in the pet trade. They are native to. Southeastern Afghanistan, Western India, Pakistan, Iraq, and Iran. They live in long, wide tanks with a range of different substrates. Ours at the center has a sand substrate. Their natural habitat is Southeastern Afghanistan, Western India, Pakistan, Iraq, and Iran. Typically, in semi-deserts and barren grasslands. These reptiles eat live insects like crickets that have been dusted with reptile dust. 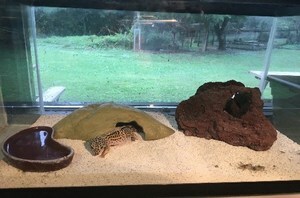 They eat once a week and can be treated to superworms every so often. In the wild they eat large spiders and centipedes. Their predators are snakes, frogs, foxes and other large reptiles. They help the environment by eating insects. 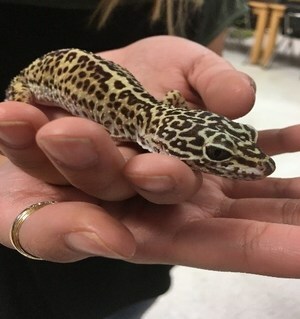 Leopard Geckos will be able 6.5-8.4 centimeters long. They have small bumps on their dorsal side(back) that gives a rough texture while their underside is smooth. They have moveable eyelids and feel very felt-like. Their tails are larger because they store fat. They have long, slim legs that hold them up when they run. When shedding they eat the dead skin after to get the vitamins from it, leaving no skin behind. They can live up to 10 years and are not endangered due to not having many natural predators. They are hatched then turn into young geckos which turn into adult geckos. They only lay eggs when they feel it is the right time and breed through January- September. Females are typically not mature until they are 9 months old. They lay a clutch every 15-22 days through a four month period and one to two eggs each time. While we are in the classroom our gecko is usually asleep because they are nocturnal. He doesn’t get very anxious when people handle him and is very calm. Our gecko matches the anatomical description.